Sounds like NBC is going to give "The Tonight Show" host Conan O'Brien a $30 million dollar exit package with another $10 million for his staff. Nice. 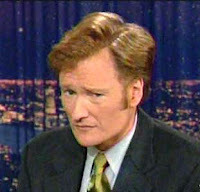 Sounds like Conan needs tax deductions. See that donate button over there on the left Conan? If you happen to read this piece, hit that button.